This is the final part of my Christmas tour. with the wonderful comments you've left for me. I have had a kitchen tree for the last several years. However, I found the need for a slightly larger tree this year. sitting at the end of our kitchen table. hoping to find something to pop the tree into eventually. 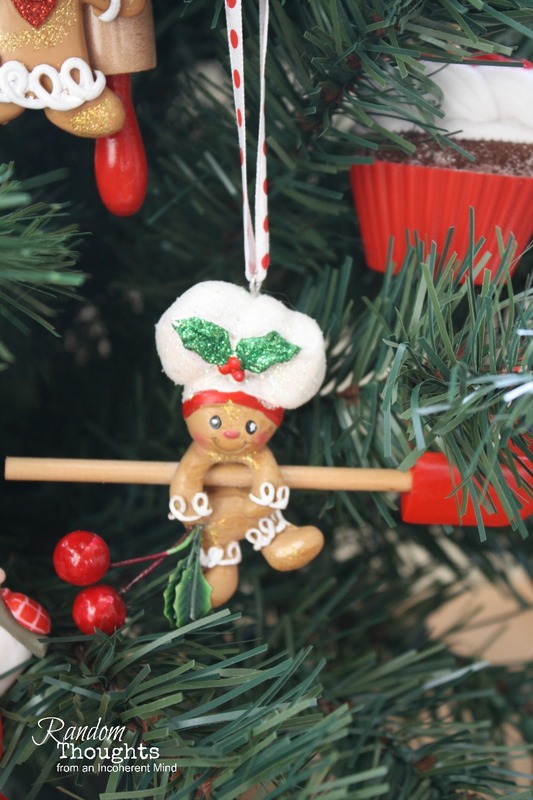 I fell in love with this gingerbread cutie. The red spatula & cherries pulled me right in! I played a little with my kitchen light this year. & added a garland of red berries. 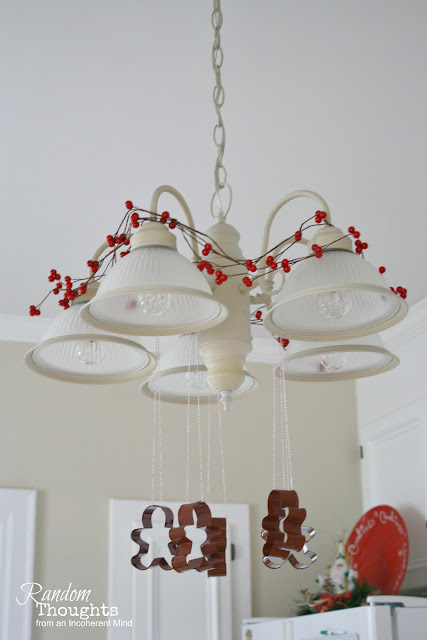 always fun to decorate in red & white. I have always loved snowmen. because I have so many snowmen ornaments. I hope you enjoyed my tour this year. I'm not sure if I'll actually get the time. cookie baking marathon very soon. I'll be in a flour haze for days & nights on end! Such terrific decorating ideas. Love to visit. Just looked over all of your Christmas decorating posts, and everything is decorated so beautifully. Thanks for the tour. I love your displays! You are very good at what you do. It's been fun! Hi Gina, such a lovely home, full of Christmas magic. I adore your kitchen cabinets with the red accessories. They really pop. The snowman tree is so cute! Happy Holidays. Have fun in the haze!! 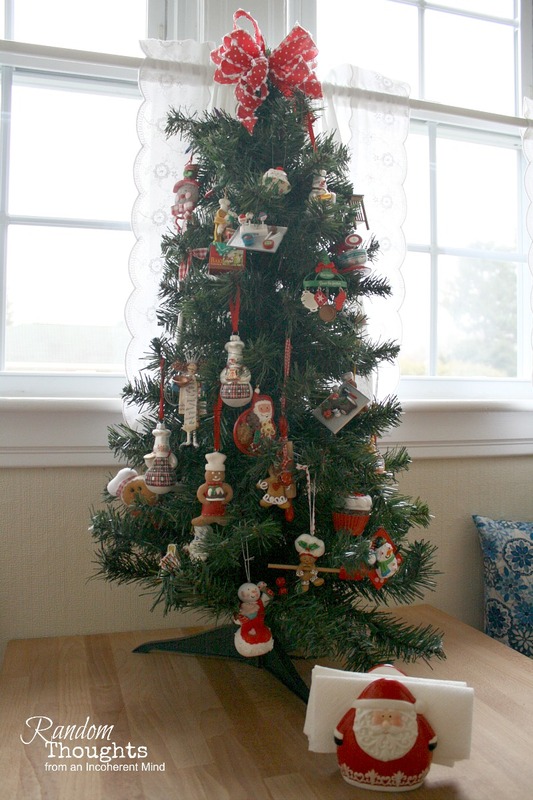 Your Kitchen Christmas Tree is absolutely adorable, dear friend!!! Love the tin cookie cutters hanging from you overhead lighting fixture!!! 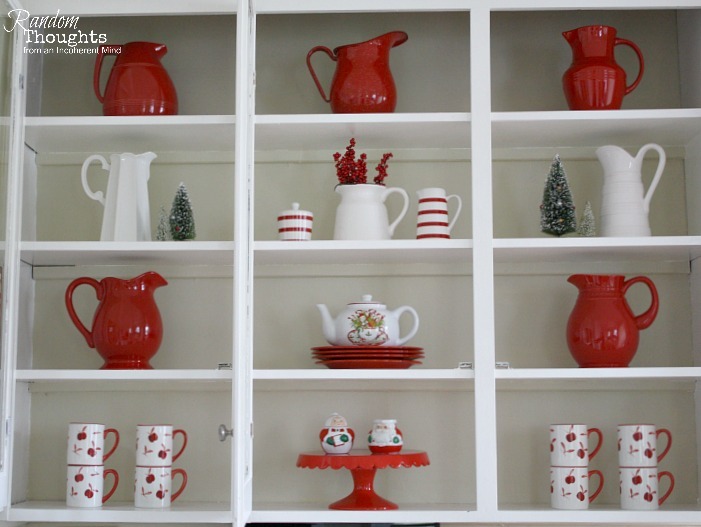 Your red and white cabinet display is stunning!!! SNOWmen melt my heart, too!!! then I get them out and keep them on display all Winter long!!! Thanks for sharing your lovely home all decked out for the Holidays!!! 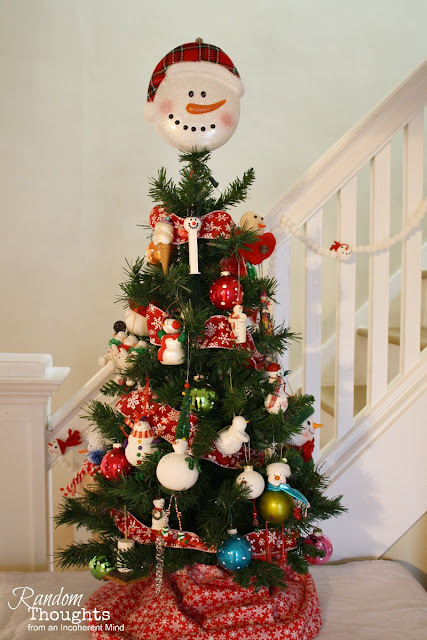 Love that snowman tree!!! So cute Gina. I'll start my baking frenzy Monday. You have fun with yours! It was so much fun touring your pretty home all decked out for Christmas. Every single space was truly very festive. Thanks for sharing. It's always fun to visit your charming home and it's especially true during the holidays! Merry Christmas to you and your loved ones!